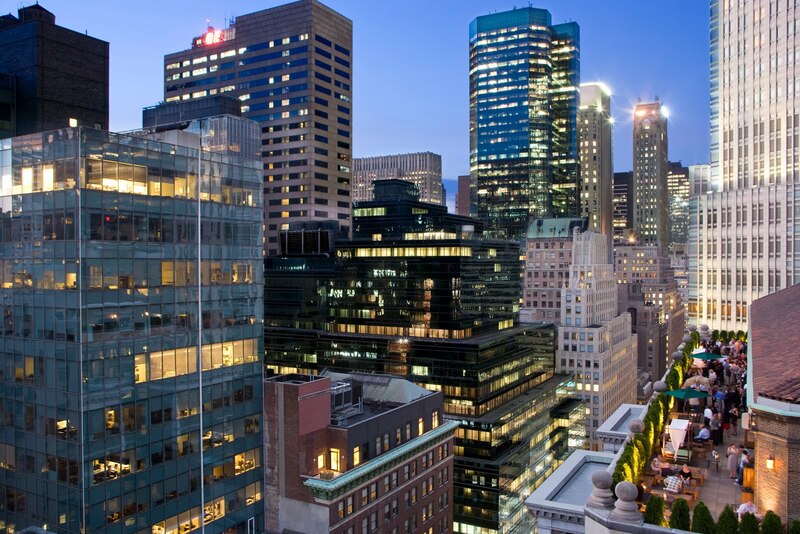 One of the major trends in New York venues over the past few years is the roof top lounge. It has evolved from a unique type of venue to a sub genre in its own right. It draws out patrons looking for an open air party during the warmer months. The most recent entries into this niche market also come with heat and retractable roofs to provide year round entertainment. Parties above the city streets are now common in Meatpacking District, LES and Midtown West. Mad46 is entering its third year in this category but you might not have heard about it yet. It is perched on top of the Roosevelt Hotel on Madison Avenue and 46th Street, just a block away from Grand Central Station. Walking into the back of the hotel, you are quickly met by a security guard who ushers you through what looks like a service entrance into a dark corridor. You won’t go three steps before you see another guard holding open an elevator to whisk you upstairs. The speakeasy mood continues when you exit the elevator and peer around a corner into an indoor space lined with lounge chairs and small groups of two and three hovering over glasses and laughing. 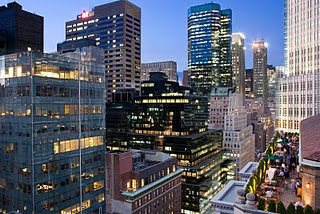 Your search for the bar will lead out outside onto a hedge lined terrace and a wide open view of the midtown skyline. The center of the terrace will reveal the bar. From here you’ll have a chance to take in the mixed aged crowd relaxing in cabanas and the view while you wait for your drink. A stroll to the opposite end of the terrace will reveal a second room with red walls and thin red columns that looks like a good place to run if the rain starts to fall. It will only take you a few sips of your mojito before you decide that this is a good place to go if you ever miss your Metro North train after work. For all its upside, the space does face some challenges. The terrace is not heated or covered although the two separate indoor rooms provide more than enough space during the colder months to keep the party going. The hours of operation end fairly early compared to other New York venues because of its connection to the hotel, so while you can start your party here you’ll have to end it somewhere else if you plan to party all night. Finally, Mad46 is fairly isolated from other marquee venues. If you want to continue to party, you’ll have to venture east to Lexington Avenue, west to Times Square or grab a cab downtown. But considering that more midtown venues are being planned even as we drink it might not be long before Mad46 become the centerpiece for a midtown nightlife expansion.